Gingham has always been one of my favorite prints to wear during spring and summer time! It’s has been a fashion staple for years that’s girly and fresh! J.Crew’s latest spring collection features a whole lot of gingham, with plenty of options to style the classic print this season! My favorite was this bomber jacket that I’m wearing here. It’s the perfect layering piece that I’ll be able to wear with so many different looks. I also LOVE this gingham top and these flats! You can check out J.Crew’s entire collection of Gingham here. I’m so excited for spring time gingham! I’ve never seen it as a moto style jacket before, but I’m loving it. Perfectly edgy and sweet at the same time. Love the pops of color as well here. This outfit looks amazing!! I love all the bright colors and how you paired the hot pink with the yellow. Absolutely gorgeous! That jacket is perfection! I love it paired with the bold pop of color from your shirt and flats. Such a great look for spring! 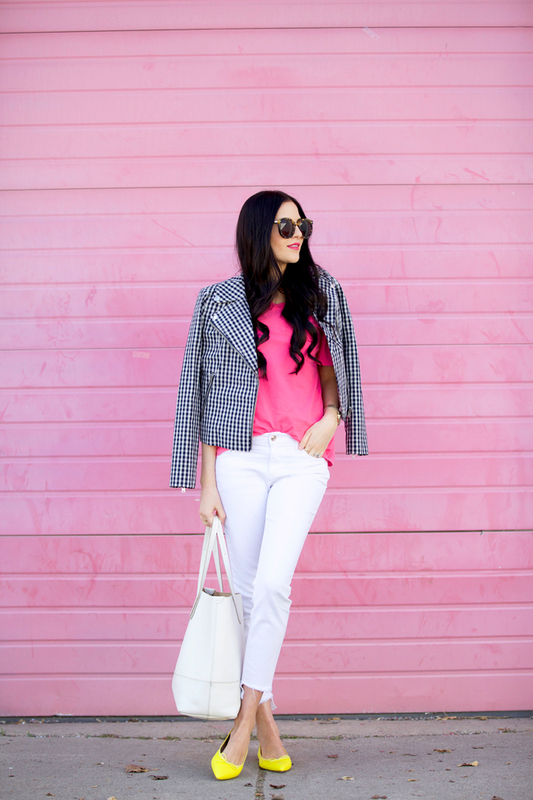 Love your gingham moto jacket! I saw it in the store on a mannequin and wasn’t totally sold on it, but it looks so cute on you! I think I need it now! The pop of color and pattern in this outfit is perfect! Love this jacket and the pops of yellow add the perfect touch! Love the little pop of yellow with those flats! I have them in red from J.Crew and love them! Navy & pink is my favorite color combination, and I love the gingham accent! 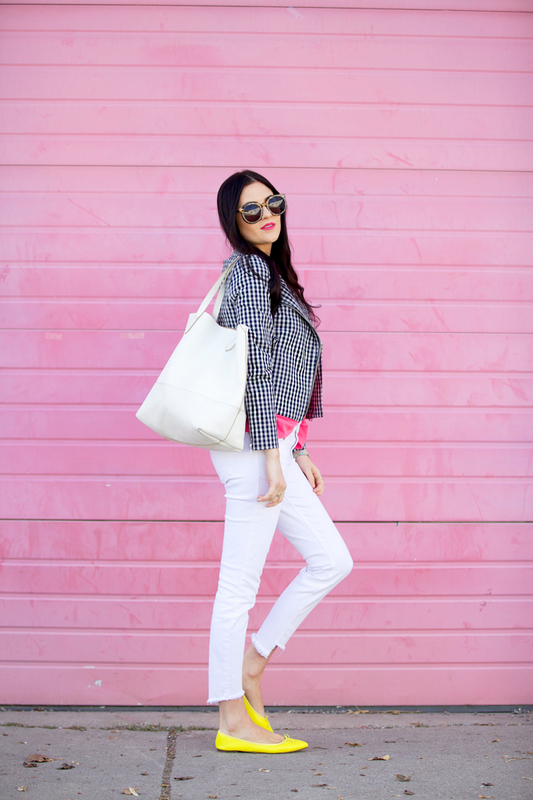 Loving the gingham with the white pants! So Classic! This outfit reminds me so much of your outfits when I first started following your blog all those years ago. It’s gorgeous! The only difference is that your hair is now longer. I still continue to be inspired by your style. That gingham jacket is too cute!! Fantastic blazer and shoes, they are making this casual and minimalistic outfit stand out 100%! This seems more classic Rachel (like your beginning fashion blogger days)… the bright colors, the easy but still glammed up styling… cute jacket, pretty pink, and fun yellow color pop! I love it too!! Seriously so comfy :) Thanks for reading Jill! Such a fan of gingham these days, loving this colorful look! I love the contrasts in this outfit, especially these flats! I have been loving all the new looks at J Crew this season!! This one is absolutely fab! I love this! that jacket is amazing! how does it fit? I want to buy but im not sure what size to get. What size are your wearing? It fits pretty true to size actually. I’m wearing a 00. Hope this helps! Gingham is the best! I know it is supposed to be a spring pattern, but I wear it all the time! Love this look! You look so pretty in this outfit! The bold pops of color are super cute. Happy Friday! OMG such an idiot, its not Friday lol Happy Wednesday!! I love gingham too, it’s like the summery version of buffalo plaid. Really adorable outfit, I just ordered those flats in the peach yesterday! Love those pops of neon! Thats a cute blazer Rach. I love these two pops of colors ! Loving these bright colors! Those flats are so cute! 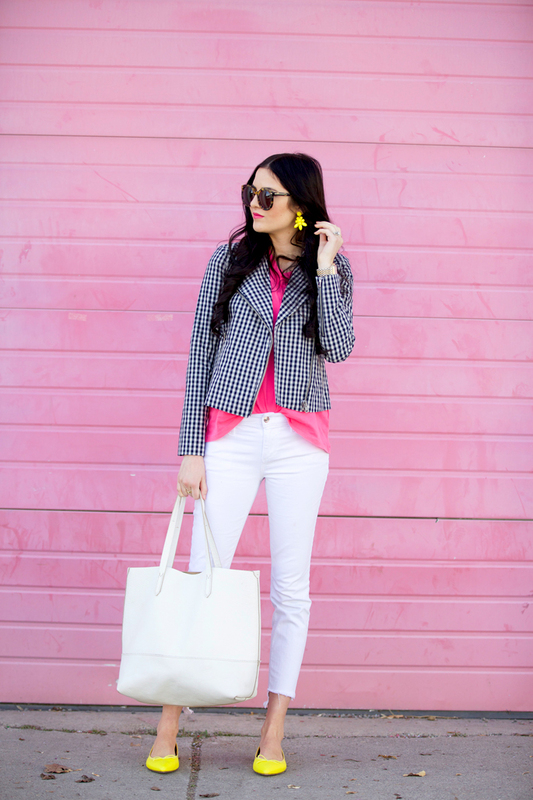 LOVE gingham for spring! Such a classic print. OMG I love all the pink! Such a gorgeous look! http://www.heartofchic.com — Isla has the prettiest, coolest mama! I love that yellow!!! It completely makes that look! Those yellow shoes are everything!! Love those frayed hem jeans!! Love the bright colored flats, they really stand out with your outfit! 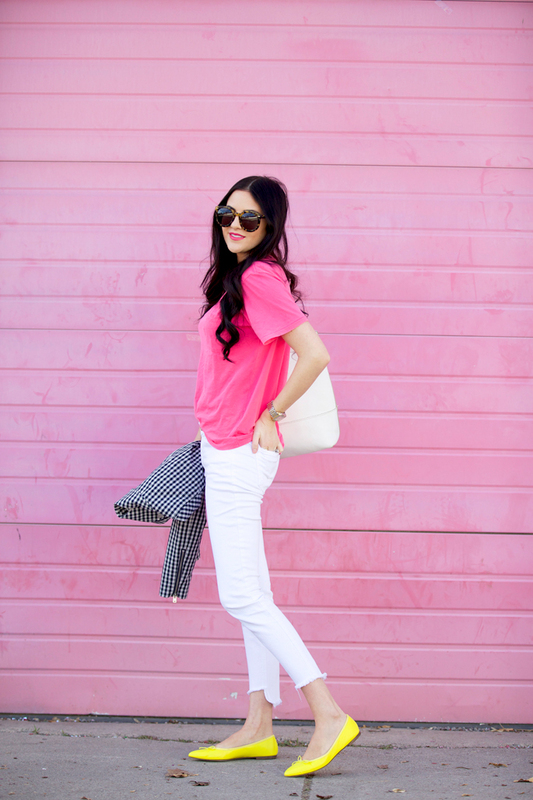 I’m obsessed with all the bright and fun pieces in this look! You look amazing! Such a cute jacket! So versitile! love all the mix of colors!! love the colors, so bright! I love, love this outfit! That gingham jacket is amazing and I love all the bright colors. 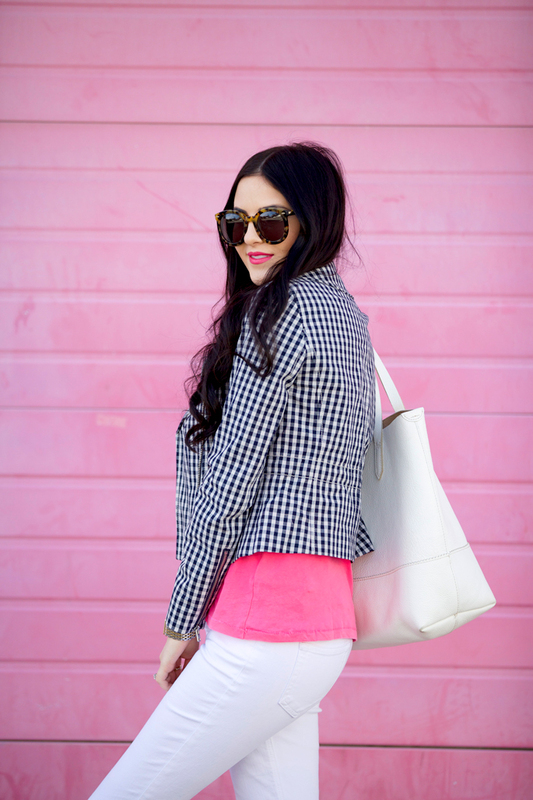 Love this spring time gingham! Love the outfit – especially the pop of yellow! Your flats are really cute! Perfect look for a busy spring day! Spring has sprung! love this look!!! I just bought a gingham tank today! I LOVE this color combo!! I’m going to sound like a grandma, but I’m not sure I understand what’s happening on the hem of your jeans. Besides that, I LOVE this outfit! I *love* this outfit! I love how the bright spring colors contrast with the white and gingham. A perfect spring outfit. Your tee is such a pretty color. I love that shade of pink!! !